With City Seen up, I’ve finally got some time and attention to get shooting for my nightlife column on Examiner. And just in time for summer concert season to begun. 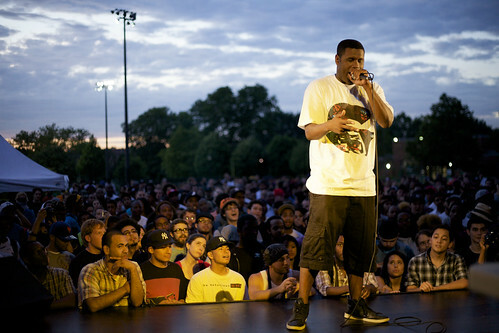 The same day I put up the show, I headed out to Red Hook Park to catch Jay Electronica open up The Summerstage series. The summer looks like it will be a good one for shows. Big Daddy Kane is playing at Von King (Marcy) Park in Bed-Stuy, Antibalas, the band behind Fela! is playing as part of the River to River festival and all sorts of acts will be in Williamsburg as part of the Northside Festival. I’m hoping to get out to as many as I can over the course of the summer to put my new camera through its paces. I also want to take another crack at shooting street musicians in the parks around the city.